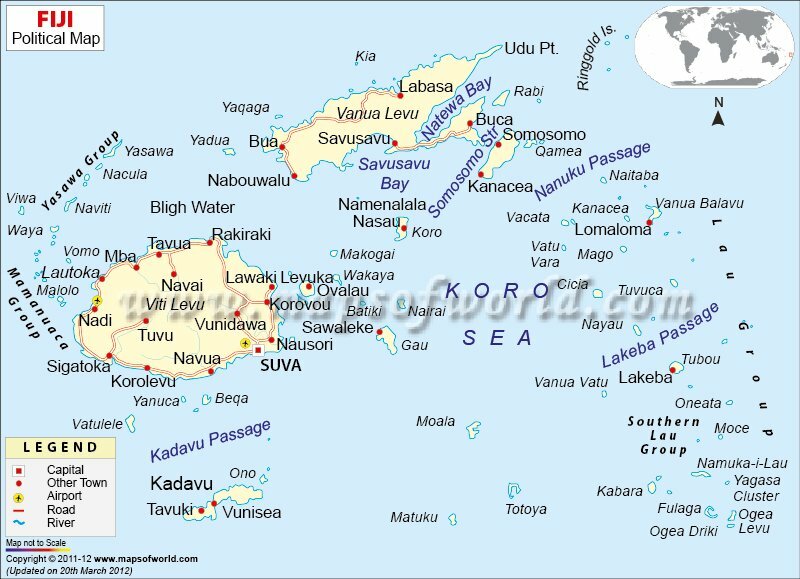 Fiji is an archipelago in the south Pacific Ocean, and a major tourist destination. Therefore, in Fiji, airports are found in all major towns which facilitate easy and efficient air travel. The archipelago of Fiji has been a delight for tourists over the years. To make sure that tourists get easy access to Fiji, air travel has been revamped and worked on over the years and now is the major mode of transport for tourists. Also Fiji being an archipelago with a number of islands, tourists and locals who want to travel between islands in Fiji also use airway as a prime mode of travel. In Fiji, airports are an integral part of both tourism and everyday travel. There are a number of airports in Fiji, which provide portals for air travel throughout Fiji. Some of these also having international flights coming to and leaving from them, to provide access to tourists and travelers. The main airport at Fiji is at Nadi. The Nadi International Airport has international flight connections with most of the major cities in the world. It also has a large number of domestic flights going to most of the important destinations in Fiji. The airport at Suva is also an important airport in Fiji. Having many domestic flights and a small number of international flights as well, the Suva airport at Fiji is an important center of air travel. Therefore in Fiji, airports offer a quick and efficient mode of travel. Fiji is an important tourist destination located in the south Pacific Ocean. In Fiji, flights to major destinations all over the world are available. Fiji is highly popular among tourists all over the world. Its warm tropical climate, beautiful beaches, great historical and cultural heritage, and the warm and friendly nature of its people are major attractions for tourists. Therefore, there are a number of flights which take people to their beloved destination. In Fiji, flights are also available for domestic travel between islands. The Nadi International Airport is the main airport in Fiji, and most of the visitors to the archipelago land in this airport. A number of international flights come to the airport at Nadi. It also has domestic flights for taking travelers to other important locations in Fiji. Flights come to the Nadi airport from major cities in the world like Auckland, London, Los Angeles, Tokyo, Sydney, Melbourne, Brisbane, Vancouver and New York. Flights also come from locations like Honolulu, Tahiti, Samoa, Tonga and Seoul. The Frequent Flyer Program of the Inner Circle Club is beneficial to the regular customers. Air Fiji has also established Airlines Tonga Air Fiji Ltd with travel agent Teta Tours of Tonga. It has facilities for group booking. Air Fiji has link ups with different resorts to provide twin service to the customers,such as accommodation and journey.